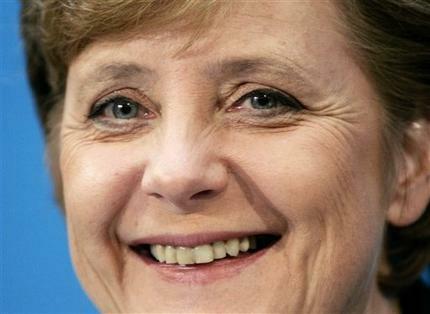 In an article by Geir Moulson of the SignOnSanDiego.com (Uninion Tribune), Conservative Angela Merker has won the election in Germany. However because it was very close and there was not a majority of the votes, the Social Democrats insisted on power-sharing. They came to a compromise. Chancellor Merkel will talk with them, and hopefully there will be a functioning government on the right track. The Socialist Democrats demanded they keep the Foreign Ministry position in order to relinquish their arguing. So it is. Merkel's Christian Democrats and her sister party, Edmund Stoiber's Christian Social Union, would get the economy, defense, interior, agriculture, family and education portfolios. With Merkel as chancellor and her chief of staff also a Cabinet-level post, the two sides would have equal representation at the Cabinet table. The parties have the right to propose their ministers. Merkel said she was optimistic about agreement on foreign policy, stressing the importance of improving relations with the United States strained by Schroeder's opposition to the war in Iraq. She has chosen Mr/Mrs. Stoiber for her Economic Cabinet position. This person is the Governor of prosperous Bavaria. Germany is suffering an 11.2% unemployment rate at the moment, so this is a fine choice. Some of the downsides of this coalition are immense. Her party, the Christian Democrats, hold 226 in the 664-seat parliament. The Social Democrats hold 222. They must have everything in order when the Parliament returns for business on October 18, 2005. [read more]. Technorati tags: Germany and Politics.